Common problems with student loan collection agencies include aggressive and abusive collection tactics and failure to accurately inform borrowers of their rights. The government and other loan holders hire debt collectors to do most student loan collection work. These private collectors are likely to act very aggressively in trying to collect from you. In many cases, they will not know about (or will claim not to know about) your right to cancel your loan or get an affordable repayment plan. Many of these problems stem from the government’s collector compensation system. Because of this system, collectors tend to steer borrowers toward the most lucrative options for the agencies. In the process, collectors may violate fair debt and other laws by misrepresenting borrower rights or otherwise providing inaccurate information. Collectors often misrepresent borrower rights. Private collection agencies are delegated the responsibility for determining the size of a reasonable and affordable payment plan for loan rehabilitation. 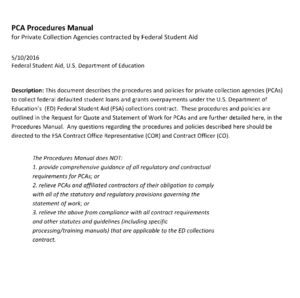 In addition, these collection agencies help determine if students have defenses to wage garnishments and tax refund intercepts, even though most collection agencies have no financial incentive to offer reasonable and affordable plans or to acknowledge defenses. Government oversight of collection agencies is generally weak. There is little public information about the government’s commission system and oversight of private collectors. Although the most recent, complete version of the government private collection agency manual is from 2009, NCLC recently obtained through a FOIA request a more recent, redacted version from May 2016. 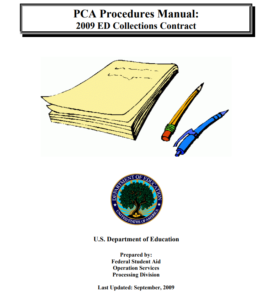 Government private collection agency manual is from 2009, 1.22Mb. Redacted version of the manual from May 2016, 6.5Mb.